The M1C sniper rifle with M82 sight was reasonably effective from 400-600 yards, but not beyond. 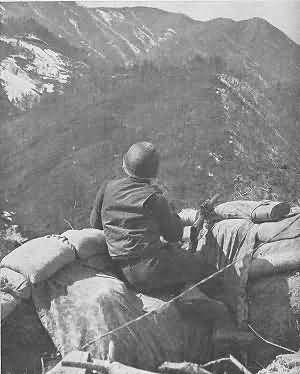 With most of the Korean peninsula covered by a complicated array of hills and ridges, much of the action necessarily took place between those ridges, especially after the war had settled into a static defense of fortified positions. Using the M1903A4/Unertl combination, Marine snipers registered a number of 1,000 yard kills, a very impressive improvement. Nevertheless, in late 1951, the weapon was declared "Limited Standard" and replaced with the M1C, for many of the reasons the M1903A3 had been replaced with the M1. Another difference in sniper action between the USMC and the Army was that Marine scout-sniper teams often had a BAR for a support weapon. In street fighting, the BAR automatic fire would flush the enemy out, and the sniper would finish him off. Right: 5th Marine Sniper, Punchbowl, 1951. With "Marine Corps Contract" 8-power Unertl telescopic sight. Notice the bolt handle has a telescope clearance notch. 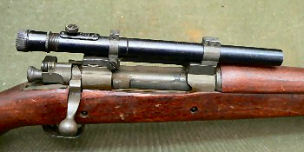 Until magazine loading, as with the M14, scopes could not be mounted directly above the barrel. A USMC M1903A4/Unertl Sniper rifle. Twelve different variations of the rifles were developed as sniper rifles beginning in 1907.